Follow my step-by-step instructions and make a classic Starbucks Chai Tea Latte at home! This drink is easy to make, tasty, and it will keep you warm during the cold season. Pour the Tazo Chai Tea Latte Base into a serving cup. Warm up the milk on a stovetop or in a microwave until very hot. Froth the milk (check “How to Froth Milk” section above). Pour the milk into the cup with Chai Tea Base. Garnish with ground cinnamon if desired. Serve. 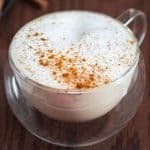 If you prefer a very hot Chai Tea, add the Tazo Chai Tea Base to the milk, and heat it up together, until it reaches the desired temperature. Then froth. Some of the dairy-free milk alternatives, don’t froth well, so your cup won’t be full, since the foam is missing. Use 4 oz. of Chai Tea Base and 8 oz. of milk in this case.